7 Reasons Why I Love to Hike with "Girls"
Hiking is my Sunday passion project. It is one of the two things I look forward to in the week that remind me of my capabilities, imperfections and my tiny place in this beautiful world. I am often asked why I'm constantly hiking with only girls and how so many of them can do something so challenging "alone." Today, I hiked with 2 of my favorite hiking buddies and it reminded me of just why I prefer hiking with girls. 1. I can be "aunatural". I can spit into the dirt, I can have dirt all over my face, I can use the "outdoor bathroom," my hair can turn to dreads, I can smell and sweat, and no one thinks of me any less as being a "girl." This is my free space to talk/look/dress how I feel comfortable and I am only received as an equal. 2. I can be vulnerable. Over the years, I have found myself to have built up so many walls that I constantly feel like I have to have a hard shell to keep going and not drown or get hurt. When I am hiking, my weaknesses are exposed. The terrain is tough and the miles are long and that hard shell eventually cracks. I know that hiking with other women allows me to peel off that outer layer, even if for a moment, and just cry, feel, yell, hurt, laugh, sing, dance and be shown that I don't always have to be so "hard". 3. I can learn and teach. I’ve hiked with women ranging in ages from 20 to 60+ and it always surprises me how easy the conversations are. Even though we might be at different stages in life, we share common feelings, goals, desires and find a voice of reason within us and our girlfriends. I can share my experiences and give advice and then receive the same. I look at these women as my inspiration and my strength. Whether someone is going through a certain milestone or heartbreak in her life, there is someone who can empathize and lift her spirits, even if just for the duration of the hike. How beautiful it can be! 4. I can discuss “girl things.” Let's face it, no matter how hard a guy can try, he can never understand a woman as well as another woman can. We are just programmed differently. On the trails, we can discuss how to be powerful women hikers while managing that time of the month, perfecting the squat pee, chafing in certain nether regions, and praising the strong bodies that we have been given. We also love sharing past dating blunders and successes. I mean, some of these hikes last 10+ hours and not all of it includes trying to catch our breaths. We have plenty of "story time." 6. I can feel strong. I find that when I've hiked with a group of women, some men on the trails like to give their opinions..."Oh you ladies have a long road ahead." "I would turn around at the 2 mile mark as that's when the snow conditions worsen." "You should set you bag down and grab it on the way back." As I said, a lot of great advice out there. Now I know a lot of people think they're "hikers" and go out to some of these trails completely unprepared, but I'd like to think when you see a girl squad hiking with 20-40 lbs on their backs and proper hiking shoes, you could give them the benefit that they've done a bit of research before embarking on the journey. I do love some positive encouragement from others, as long as it doesn't come with a condescending tone. That's why I love hiking with my girls. We empowering each other, shout positive mantras to each other, and sing our hearts out when we make it to the top. I love squashing the male hiker stereotypes and proving that you can be any gender, any age, any physical level to conquer a mountain as long as you hike your own hike! I may not get there as fast or with quite the grace, but I will get there. I can also feel more self efficient as I don't have a male to "rescue" me and I know I need to be prepared for any kind of situation from the get-go. 7. I can make trustworthy friends who are up for future adventures. I am so grateful to have hiked with some of the most loyal, strongest, and dependable women. I watch out for them on the trails and know that they also have my back/front/side. These are the best kind of people to have on adventures, especially for overnight multi-day trips. If you can tolerate them in the most raw conditions for a full day, you are pretty much set on travel buddies. We know each other's health conditions, weaknesses, fears, and strengths. We make sure everyone is safe and try to make the most enjoyable environment for each other. While guys can also do this, I have found that women are more likely to open up about their needs to create an effective game plan earlier in the hike. 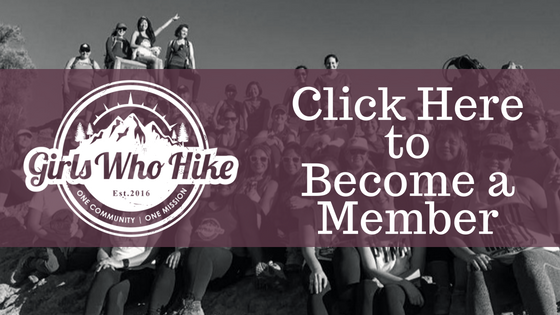 Now go find yourself some girlfriends to make unforgettable hiking memories with! Sasha is the Ambassador for our Los Angeles chapter. You can join her local meet ups and discussions through the Los Angeles chapter by clicking here.